Fabric material air prunes the root structure of the plant, promoting better growth. If your native soil doesn't drain well or is not as vegetable friendly (sand, hard clay, etc), raised beds offer up a perfect solution. If you have back trouble or any problems bending over, raise bed gardens are the perfect solution. You can even place these on a tabletop to ease the need to bending over. Or place them on the ground and put a chair to the side of the raised garden bag. Raised bed bags help defeat the problem of burrowing pests. Weeds are much easier to control as you are beginning with weed free soil. 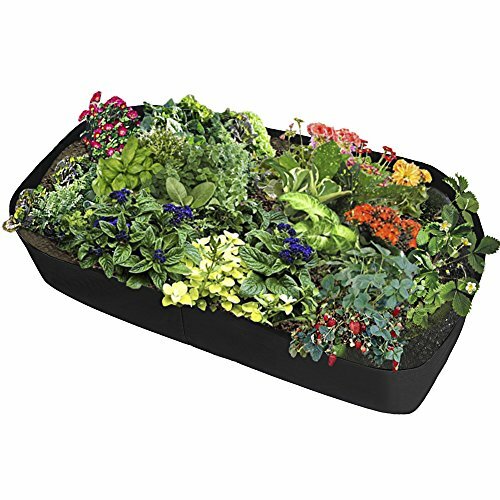 Instant fabric soft raised garden bed for plants, flowers and fresh herbs, vegetables and fruit. Ready to go out of the box; No assembly required. Unfold fabric raised bed bag, fill with planting mix, and you're ready for a productive garden. Fold for storage, reuse year after year. Made of felt material, a highly durable, UV resistant, non-woven fabric that provides exceptional air flow throughout the soil and root systems and allows excess moisture to easily drain away. Rectangle shape; can be placed on any flat surface (grass, patio, concrete, etc.). Raised bag beds allow you to have a garden in limited space. Suitable for your crete gardening, balcony, rooftop, back porch, greenhouse, tabletop or other raised platforms. If you have any questions about this product by RTWAY, contact us by completing and submitting the form below. If you are looking for a specif part number, please include it with your message.